We have been thrilled to be enjoying some time in the winners enclosure just lately with two victories within the past week at both Southwell & Stratford on consecutive Sundays. Albeit it’s a quieter time of year for us at the moment & certainly the prolonged heatwave & dry spell have not helped, the horses that have been running have been running well. Last Sunday saw Flying Verse get his head in front again for the second time this season & again at Southwell which was also the scene of his previous victory earlier in May. 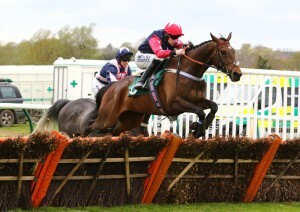 Flying Verse was having just his second start for his new owners Dr C. A. Barnett & Partner when he landed the mintbet.com Handicap Hurdle under jockey David Bass. Flying Verse loves Southwell, stays 3m & enjoys top of the ground so everything was in his favor to run well & after initially being held up early in the race, he was ridden to lead after the last & stayed on nicely all the way to the line. Above – Flying Verse posing for the camera at home. 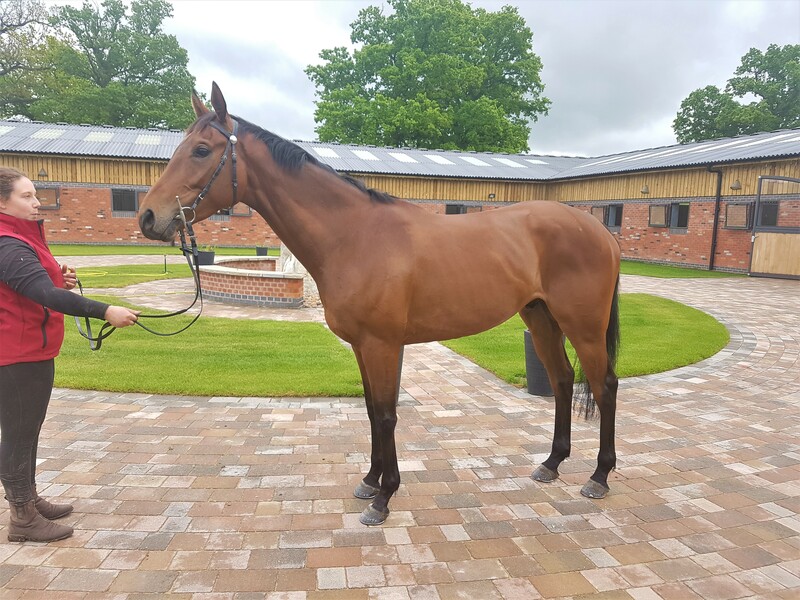 Getaway Honey was our second winner in a week when she took the Dan Skelton Racing Mares’ Standard Open National Hunt Flat Race yesterday (Sunday 22nd July) at Stratford under jockey Brian Hughes. This was only Getaway Honey’s second start since joining us in May & followed up her very promising 2nd place at Worcester earlier this month for new owners Taylormaid. Already a point to point winner in Ireland, Getaway Honey already has experience over obstacles under her belt & has proven that a 3m trip is no problem so to have added a 2m bumper to her record can only stand her in good stead for the future to which we are very much looking forward to now. 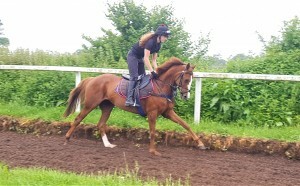 Above – Getaway Honey on the gallops. 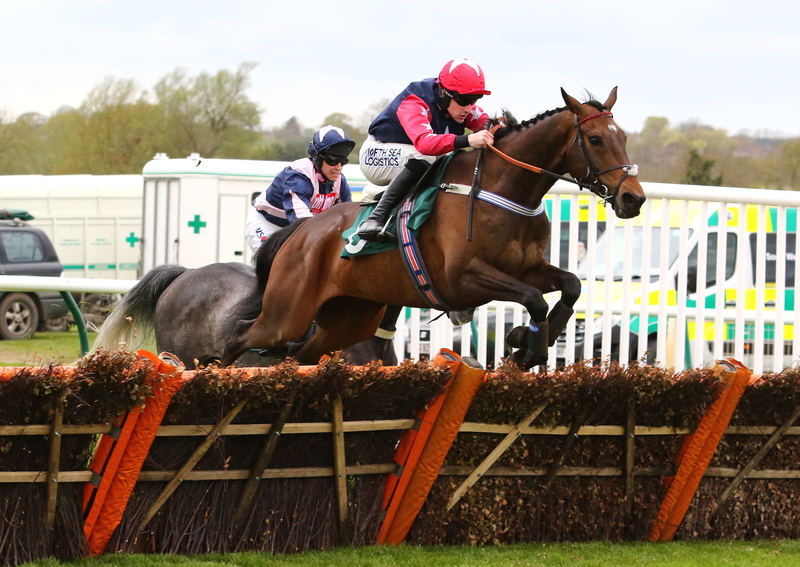 Marquis Of Carabas was a touch unlucky on his latest outing when running a cracker only to be beaten a short head into 2nd in the Christian Williams Racing Handicap Chase at Ffos Las earlier this month. Giving a full 14b away to the eventual winner Lotus Pond, Marquis Of Carabas just lost out on the nod after a ding-dong battle all the way up the straight. Above – Marquis Of Carabas back in his hurdling days. 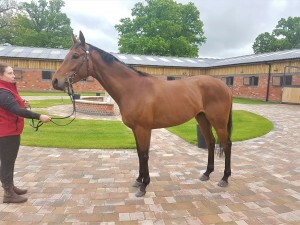 It is likely that we will have a further few quiet weeks yet runners wise but we can look forward to Swissal lining up in the J Edwards Sellars Investments Handicap (2.00) tomorrow (Tuesday 24th July) at Ffos Las & a lot of the winter jumpers will be having their shoes on this week ready to make their way back into work.